The Argoun palm is an extremely rare species of fan palm from the Nubian Desert in southern Egypt and northern Sudan. It survives only in desert oases where ground water can be found. It is ecologically important as one of the few, large trees in the Nubian Desert, providing shelter and food for desert wildlife. 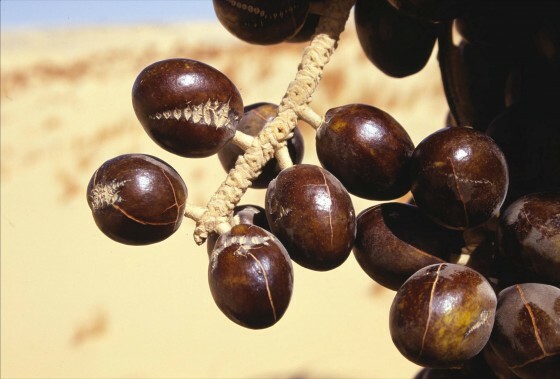 Prior to its discovery in the wild in 1837, it was known from fruits collected by archaeologists from Egyptian tombs dating back to 2500 BC. In Pharaonic times, it was cultivated and regularly placed in tombs as an offering for the after-life. In the twentieth century the species was considered extinct in the wild until its rediscovery in Sudan in 1995 and in Egypt in 1998. The species is still used by local Bedouins who extract the leaves for making mats. The mats are softer and stronger than those made from the more common doum palm (Hyphaene thebaica) or date palm (Phoenix dactylifera). It has been reported that the wood is used to build houses and that the fruits are edible. The rarity of the Argoun palm in current times is paradoxical, given its frequent occurrence in ancient tombs. It seems likely that it once had a broader distribution than it has today. 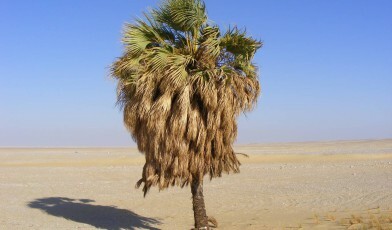 The Argoun palm’s range may be shrinking as a result of long-term climate change. Rainfall in the Nubian Desert is extremely infrequent (approximately one rainfall per decade) and a reduction in frequency may lead to changes in ground-water patterns, upon which the palm depends on. Exploitation of the leaves is a potential threat as is degradation of habitat by human disturbance, vandalism, fire and agricultural activities. Monitoring in Egyptian sites reveals no recruitment in the past decade. Argoun palm habitats are in dire need of protection from human disturbance, ideally by the establishment of protected areas. Local awareness of the risks to Medemia habitats still needs to be increased and ex situ populations established. Educational programmes and an ex situ nursery have been initiated in Aswan by local conservation groups. Many thanks to Haitham Ibrahim and William Baker for all of the information on this tree and for supplying all images. Medemia argun – Past, Present and Future. Palms 53: 9–19.